Reading, researching and listening to others about the benefits is great but at the end of the day – it’s all about experiencing it. People that suffer from acid reflux and GERD have experienced less symptoms because Travel Water neutralizes the acidity that triggers the attacks. Read more. Alkaline water is an anti-oxidant, a negatively charged particle. Aging is caused by the breakdown of tissues in the body Drinking Alkaline water will reduce the risk of the breakdown of tissues. Just a few drops of Travel Water can be beneficial to your health. Doctors believe that acidic food promotes the growth of cancer cells. Reduce the effect of the acid in your food intake by drinking alkali water with your meals. Visit our research section to read up on the studies that show how effective an alkali environment is at destroying cancer cells. Drink Travel Water to reduce the effects of Osteoperosis (Bone Loss). Dietary acid charge enhances bone loss. Bicarbonate or alkali diet decreases bone resorption in humans. Eliminate bacteria like E. coli, Salmonella, and organisms in your drinking water. Research has shown that an Oxidation Reduction Potential of 650 to 700 mV kills spoilage bacteria such as E. coli and Salmonella within a few seconds. Spoilage yeast and the more sensitive types of spore-forming fungi are also killed at this level after a contact time of a few minutes of less. It just works! A few applications of 15 drops of Travel Water to your armpits and other smelly parts kills the bacteria and neutralizes the odor. Don’t mask the smell, kill the source! Use Travel Water to eliminate these harmful organisms in your drinking water. Use Travel Water to clean your fruits, vegetables, seafood without altering their taste or texture. E-coli O157:H7 >300 s <60 s <10 s Salmonella spp. >300 s >300s <20 s L. Monocytogenes >300 s >300 s <20 s Thernotolerant >48 h >48 h <30 s Prepared by: Trevor V. Suslow, Ph.D. (Extension Specialist) Postharvest Quality and Safety from Seed to Shelf Dept. of Vegetable Crops, University of California Enhance your liquor by neutralizing the acid thereby giving it a smooth taste. That’s right. Say goodbye to the acidity that traces your throat. 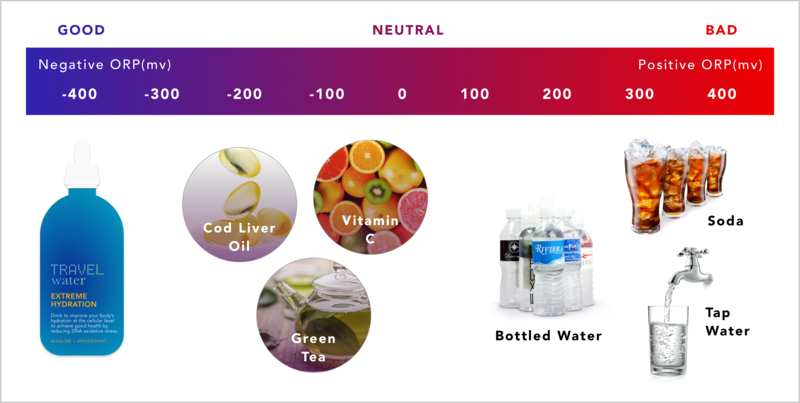 One drop of travel water neutralizes the acidity of even the strongest vodka leaving your drink smooth and keeping the taste pure. Whiskey drnkers will appreaciate the added smoothness. Purchase lower quality whiskey and turn it into a drink that rivals older aged libations.